C. Northcote Parkinson, the British historian and writer who propounded the notion that "work expands so as to fill the time available for its completion," died Tuesday at a clinic near his home in Canterbury, England. He was 83. The cause of death was not announced. Mr. Parkinson first put forth his famous dictum in an article for The Economist magazine in 1955. The article brought him considerable attention, and in 1958 he published an expanded version, "Parkinson's Law." Mr. Parkinson said the theory had its roots in his experience in World War II, when he worked in training and administration for the War Office and the Royal Air Force. "I observed, somewhat to my surprise, that work which could be done by one man in peacetime, was being given to about six in wartime," he told The Times of London. "I think this was mainly because there wasn't the same opportunity for other people to criticize. You could always riposte: 'Don't you know there's a war on?' "
His work was a mixture of serious economic analysis and satire. He argued that administrators and executives tend to make work for each other, and that because executives prefer to have subordinates rather than rivals, they create and perpetuate bureaucracies in which power is defined by the number of subordinates. A committee, he said, "grows organically, flourishes and blossoms, sunlit on top and shady beneath, until it dies, scattering the seeds from which other committees will spring." Cyril Northcote Parkinson was born on July 30, 1909, in northern England. He attended Cambridge University and received a doctorate in history from Kings College in London. He taught at Cambridge and at a private boys' school in the late 1930's, before his wartime service. After the war he became a lecturer in naval history at the University of Liverpool, then moved to Singapore in 1950, where he became the Raffles Professor of History at the University of Malaya. After the publication of "Parkinson's Law," he went on to complete scholarly works, including "British Intervention in Malaya, 1867 to 1877." He wrote more than 60 books, including "Mrs. Parkinson's Law" (1968), which applied his principle to the household level. He also wrote business histories and fiction, including "Jeeves: a Gentleman's Personal Gentleman" (1979), the "biography" of the hero of the P. G. Wodehouse novels. Mr. Parkinson is survived by his third wife, Iris Hilda Waters, whom he married in 1985, a son and a daughter from his first marriage and two sons and a daughter from his second marriage. "... "New Book by C. Northcote Parkinson" ..."
"New Book by C. Northcote Parkinson"
a history of the contact of Europe and Asia since the fall of Troy, is the author's thirteenth book. Carroll Quigley, author of The Evolution of Civilizations, teaches history at Georgetown University. C. Northcote Parkinson, one-time Professor at the University of Malaya (but now removed from academic halls to the more remunerative work of an economic consultant in London), has produced more than a dozen books over the last 29 years. Most of these sank with scarcely a ripple, until, in 1957, his Parkinson's Law roused widespread enthusiasm. Its attack on bureaucracy and Big Government was kept afloat in a sea of jokes which helped to conceal the fact that the author's basic outlook was contemporary with Herbert Spencer (1820-1903). Three years later, Parkinson shifted his attention from politics to economics, and, in The Law and the Profits , attacked the basic principle of twentieth century taxation from a Spencerian (or John Birchite) point of view. He deplored the graduated income tax and any tax of over 25 per cent. This book, with fewer and poorer jokes, revealed its author's old-fashioned outlook to anyone who reads with both eyes. Now Mr. Parkinson has shifted his field once again, this time to history. Lacking his earlier camouflage of jokes, except in isolated spots, East and West shows that Parkinson's historical training is as dated as his politics and economics, almost pure Oxbridge, vintage 1880. And unfortunately, not one of the better samples of that year. Except for its length, this work might pass for an undergraduate tutorial essay worthy of a "gentleman's C" or of a Third Class in the Final Schools examination. The characteristics of a mediocre book are not very much different from those of a merely "passing" undergraduate essay and are fully evident in this volume: (1) underlying confusion of thought, and thus of organization; (2) inadequate knowledge of the evidence; (3) limited reading of up-to-date authorities; and (4) masses of factual information without strict control of its relevancy. For Parkinson, as for his Victorian contemporaries, the meeting of East and West begins with the Iliad (on page 1) and advances chronologically, based on the writings of Herodotus, Xenophon, Plutarch, and the lesser historians of the wars against Carthage and the achievements of the Caesars, with much borrowing from that up to date writer, Edward Gibbon. More than half the volume is concerned with the period from the fall of Troy to the fall of Constantinople, and much of the rest is a prosaic account of the expansion of Europe to Asia (especially southern Asia) since the fifteenth century. The period before 1000 B.C., the immense impact of archaeological discoveries since 1880, the newer literary evidence obtained from the twentieth century's deciphering of papyrus and archaeological inscriptions are ignored. As a result, Parkinson believes (galley 45) that the "first wave of oriental influence to reach Europe came from Persia....Zoroaster [about 500 B.C.]" Such a statement wipes aside almost the whole of European, including Greek, culture as non-existent even when, like the alphabet, it was called by an Asiatic name. Parkinson has a whole chapter on Alexander the Great, but ignores all recent work on the subject going back to W. W. Tarn (1938). His extensive attention to military exploits may seem to reflect the present (1963) concern with military history, but Parkinson's approach is biographical not tactical, and his treatment of war recalls my own happy days reading G. A. Henty. There are scattered footnote references to books on the history of armaments but no evidence that Parkinson really read them, for he tells us such untruths as that the crossbow could be "shot with accuracy from a horse ridden at a gallop" (gal. 59), that "the real cavalryman" was invented by Macedonia before Alexander the Great's time (galley 21) (when real cavalry could, in fact, come into action only with the invention of stirrups many centuries after Alexander). Much of the amorphous character of this volume arises from failure to define its terms. The first five words of the Introduction read, "This book deals with civilizations," but there is a firm refusal to demark any civilizations or culture areas. Instead, it soon appears that the author is thinking of Asia and Europe as geographic areas (which he mistakenly divides at the Ural Mountains and the Caspian Sea instead of at the Pripet Marshes, which form the only meaningful boundary.) This two-part division leads to great confusion because the situation can hardly be understood in terms any simpler than a four-factor mélange (Western, Asiatic, northern steppe grasslands, and Semitic). Culturally the optimistic and balanced empiricism of the West and the resigned Heraclitean flux of Asia have been separated by the rationalistic, dualistic, and often extremist, outlooks of the Indo-Europeans and the Semites. The former of these buffers left its imprint most strongly on Iran (Zoroaster and Mani) and on Greece (Plato), carried on through Byzantium and Russia. It is a fundamental fact in any history of the contacts of Asia and the West that many of these contacts were filtered through the two buffers of the Indo-European and the Semite cultural heritages. Even in Parkinson's day under the great Queen Victoria every school boy knew Ex Oriente Lux . Europe's peoples and languages came from the east as did the very basic attributes of European life: its food (wheat, beef, lamb, swine, fowls), its textiles (wool, linen, cotton, silk), its systems of measures (12 eggs in a dozen, 12 inches in a foot, 12 hours in the day and in the night, 60 minutes in the hour), its basic technology (writing, the wheel, paper, printing type, gun powder, the plow, the number system), and those three major targets of Parkinson's antipathy, governmental bureaucracy, taxation, and state regulation of economic life. Even today, a London economic consultant wears trousers and a jacket slashed in the rear so that the sides will hang straight as he sits on his horse, attire derived from a Turkic cultural predecessor in the central Asian grasslands of two millennia ago. This volume contains scores, possibly hundreds of gross factual errors. If these were based only on the ignorance and prejudices of 1880, we might pass over them in silence, but when they join the current campaign to corrupt our youth with the myths of John Birch they should be pointed out. Parkinson tells us (galley 67) that the decline of Asia after A.D. 1000 was fundamentally due to biological decadence but the "immediate cause was of course, excessive taxation." We are solemnly informed (galley 102) that Marxism, like Marx himself, is "a religion derived ultimately from Judaism." Or again (galley 76), of British "administrative talent...the best always went overseas, leaving only the dregs in Whitehall." As long ago as the time of Alexander the Great, Greek ascendency in Asia meant that "democracy had to go" (galley 21). And of course, the fall of Rome in the West was due to "overtaxation" (galley 47). These numerous outbursts of personal prejudice are buried in great masses of simple factual errors. Parkinson's knowledge of geography, despite his personal travels, is woefully deficient. Roman military control of the Balkans in the 3rd century, he says (galley 47) required "the reconquest of Dacia and Mesopotamia", a statement which is not only nonsense, but implies that Rome had previously held Mesopotamia. Or again (galley 51), he tells us that the Arabs, about 800, controlled the whole trade route between Canton and Cordova -- "from end to end." Fortunately Parkinson does not launch this myriad of errors on the reader without fair warning, for in the Preface we may read, "Given a more suitable diet, as recommended by the food reformers (plain food, uncooked, and Spartan) I might perhaps have had the energy to ransack libraries....Instead I have relied upon the results of desultory reading...." Surely an honest statement, but without scholarship, the volume certainly needs more jokes! Cyril Northcote Parkinson, writer, historian and economist, born 30 July 1909, Raffles Professor of History University of Malaya 1950-58, books include Edward Pellew, Viscount Exmouth 1934, The Rise of the Port of Liverpool 1952, Parkinson's Law: the pursuit of progress 1958, British Intervention in Malaya 1867-1877 1960, Mrs Parkinson's Law 1968, The Law of Delay 1971, Industrial Disruption 1973, Britannia Rules 1977, Jeeves: a gentleman's personal gentleman 1979, The Guernseyman 1982, The Fur-Lined Mousetrap 1984, married 1943 Ethelwyn Graves (one son, one daughter; marriage dissolved), 1952 Elizabeth Ann Fry (died 1983; one daughter), 1985 Ingrid Waters, died Canterbury 9 March 1993. ASK ANYONE if they have heard of 'Parkinson's Law' and they will probably answer, 'Yes, but I can't call it to mind.' Tell them that 'Work expands to fill the time available for its completion' and they will laugh and say with feeling that they most certainly have heard of the law, and understand its effects completely. C. Northcote Parkinson coined the phrase which is now known and quoted by frustrated business people (indeed, anyone trying to find 'spare' time) all over the world. Parkinson first presented his formula in a humorous and paradoxical article for the Economist in 1958. This and a further series of essays were published by John Murray as Parkinson's Law in the same year with illustrations by Osbert Lancaster (it remains in print as a Penguin Business 'Management Classic'). He based his law, aimed largely but not only at the workings of bureaucracy, on experience gained in the Second World War with an Officer Cadet Training Unit in the RAF, and as a War Office staff officer. Most of Cyril Northcote Parkinson's large output as a writer disguises this wonderful sense of humour. As an authority on maritime history, in particular the Napoleonic era, he has a wealth of informative books to his name, including Trade in the Eastern Seas (1937), The Trade Winds (1948), The Rise of the Port of Liverpool (1952), War in the Eastern Seas (1954), as well as an imaginary biography, The Life and Times of Horatio Hornblower (1970). As with the Hornblower biography, he used his historical knowledge to write the 'Delancey' saga, naval historical novels about a young midshipman in the Napoleonic wars, and his rise through the ranks eventually to become Admiral of the Fleet. An unassuming man, Parkinson lived the latter part of his life modestly, if elegantly, in a Canterbury close, continuing to write on the subjects he loved most. His middle years, however, after the phenomenal success of Parkinson's Law, were taken up with lecturing and after-dinner speaking. He found it hugely amusing that he should be so appreciated in this way, and yet his easy manner and witty turn of phrase invited the attention of the most reluctant listener. His early life was 'rather dull', he thought: educated at St Peter's School, York, he went on to study History at Cambridge. He left to become a historian, and took a further degree in London. After returning to Cambridge to do research, he could see only a dull future. 'There seemed to be nothing ahead but a series of professorships', he said. 'So I began to write books on naval history instead.' His first teaching post - arranged around his writing - was at Blundell's School, Tiverton. He wrote a book about it, attracted particularly by - as he explained - 'the school's most distinguished pupil, Guy Fawkes'. He later lectured in naval history at the Royal Naval College, Dartmouth, a post he held at the outbreak of the Second World War, and assisted in the formation of the National Maritime Museum. He restored and lived for many years at Elham Manor, in Kent, while continuing to write books and lecture on naval and maritime history. In 1950 he experienced a complete change when he accepted a chair as Raffles Professor of History at the University of Malaya, a post he held for eight years. The end of his time in Malaya came soon after the publication of the book which was to transform his life. With obvious delight he reported what Enoch Powell said of him: 'He's like a man who found an oil-well in his back garden.' The first publisher to which the book was offered returned it promptly. The second, Parkinson said, 'threw it in the wastepaper basket, but later retrieved it and thought again'. After the success of Parkinson's Law, he entered the world of after-dinner lecturing and continued to be amazed that so many people wanted to hear him speak; he was often asked to give hour- long lectures to audiences of up to 8,000. After Leaving Malaya he held visiting professorships at Harvard University, in 1958, and the universities of Illinois and California in 1959-60. Thereafter he gave up his 'proper job' as an academic to devote his time to writing through the winter and lecturing across the United States in the summer. It was with relief that he eventually gave up the lecturing circuit to live quietly with his third wife, in Canterbury, having moved there in 1989. Here he relaxed in peace in the shadow of the cathedral, and worked on his final project, his autobiography, A Law Unto Myself. Wanted–Prime Minister of Ruritania. Hours of work: 4 A.M. to 11.59 P.M.
Nearly two years ago, I posted an album featuring C. Northcote Parkinson speaking on the subject of Democracy. I mentioned that, when I had picked up that album, I also got two more albums in what was a ten part series of interviews with Parkinson, regarding various political systems. Since then, I've had a couple of requests to feature the other two albums, and so that's what I'm doing today. Album seven in the series covered "Dictatorship", and album eight covered "The Russian Communist Theocracy"
"Dr. Parkinson adheres to the pessimistic belief that democracy died a long time ago as a creed and an inspiration and while he feels that dictatorship is the characteristic 20th Century form of government, he believes that all systems end to bear the seeds of their own destruction...that no one system is best for all countries and for all times". "As computer hardware capacity increases, software becomes more bloated." Whereas Parkinson was primarily concerned with people, his law is equally applicable to machines, particularly computers; for example, Parkinson's Law can be applied to computing in terms of "Data expands to fill the space available for storage." Years ago I had a Compaq Presario computer with 50mb of disk space, which I considered substantial at the time. I never dreamt I would be able to fill up the hard drive. But, of course, I did (as well as other PC's I have had over the years). My current PC has a hard drive with a capacity of 224gb and though I'm a long way from filling it up, inevitably I know I will for two reasons: I now feel more comfortable with downloading large multimedia files (MP3, AVI, WMV, etc. ), PDF files, data base files, and other larger file formats, and; Second, because developers have become sloppy in programming. This has a real application to software development. Assume the best-managed project, with realistic task estimates worked out in collaboration with the developers. Every project planning method has in its predictive calculations an assumption: that the task estimates are estimates only and that we can expect some to deliver sooner and others to deliver later. That's what we mean by "estimate." The problem with that is that projects are neither structured nor managed to take advantage of delivery sooner. We still run software projects like construction projects where early delivery, of concrete for instance, can be a real problem. On a contract job, there's the more tangible issue of unrealized billable hours. And then there's human nature: if a particular task turns out to be easier than the developers predicted, the delivery estimate is easily met. If things go wrong, it's missed. There's no "sooner." With only "on time" and "later" to choose from, we run headlong into not just Parkinson's Law, but the flaw of averages and Jensen's Inequality: on average, tasks are late and with a probability approaching certainty, the project is late. This effect applies recursively, which is why it seems not to matter how much contingency you put in the plan, it can't be enough. This is a non-trivial challenge. One possible solution is to have a "strategic" plan that's not shared with the developers. The developers continue to work to the estimates they developed, task by task eating up the backlog. The PM's strategic plan, on the other hand, has the longer estimates taking the "sooner" cutoff into account. "Data expands to fill the space available for storage." Alternatively, and more generally, "demand expands to exhaust the available supply". "For a given ecosystem, use of non-limiting resources increases until they become limiting resources, unless such increase is prevented by other limiting factors." This "law" like pretty much every pithy "law" about computer systems that's ever come down the pike, is pretty much false. When hard drives expanded beyond the megabyte range, did you see the total usage of text documents expand beyond, say, a hundred megabytes or so? No, you did not. What you saw was a new demand for images. And when storage went into the tens of gigabytes range, then you saw new demand for audio. At the hundreds of gigabytes range, we have new demand for video and computer games. Now, an idiot can think that this is some kind of magical process where new demand is created out of nowhere, but it isn't. New demand represents pent up demand which has migrated to computer storage from other forms of storage. Text existed in books. Pictures and photos existed in magazines. It's cheaper to store them on a computer now than in a magazine. Music existed on vinyl records and then audio CDs, same story. Software existed on data CDs, same story. Movies exist on DVDs, same story again; as the new media advances, the old media is being displaced. Now, if you aren't an idiot, you'll ask yourself "what's the next general information source which can be transferred to electronic storage?" And the answer is this; there isn't one. That's it, this is the end of the road! Wrong answer. There are many general information sources that inherently offer continuous demand for storage resources: Cameras, distributed sensors, transaction logs, communications traffic, databases that maintain history, associative-memory for learning AI's, maintaining decision-trees, keeping data around for latent semantic indexing, etc. These things will consume and consume and consume without upper-bound; even if storage grows beyond what a single camera will consume, there would just be more cameras. It is true that there is an upper limit to the information we, as humans, will ever will directly access in our finite life-times; however, that still leaves the desire for an infinite well of information and derived knowledge to be readily available at a moment's whim. I want a device that sits on my shoulder and takes a continuous video of every thing I experience, all day. I want it to record all my conversations and store them both as raw sound, and as indexed, search-able, bookmark-able text. I want to instantaneously look up any point in time by timestamp or search by content. It would mean never having to take notes again. Oh, and I never want to have to delete any of it, until I die. We do not began to have the storage for that. Once we have that I want to extend it to recording physical sensations. I believe that we will always come up with something more expensive to store. If you can't think of one, that is a failure of your imagination, not an exhaustion of the idea space. -- MatthewScouten? Now, that doesn't mean that storage can't evolve, there's plenty of room for it to evolve. But raw size of storage is not one of the dimensions along which it can evolve much longer. Hard disks can evolve to be more redundant; RAID & LoggingFileSystem which use up space for increased reliability and speed. They can also evolve to have smaller form factors; tiny hard drives in iPods. Or we can even abandon hard drive technologies for much faster flash RAM; USB keys. What isn't going to happen is a vast expansion of storage capacity into the 1000 terabyte range. The economics for it are quite clear; there is no pent up consumer demand for this. The notion that "demand fills up supply" also vastly oversimplifies a complex situation. In most cases, a drop in prices leads to vastly greater total expenditures. So when the price of coal was cut in half due to new technology way back when, then the total usage of coal quadrupled, and the total expenditure on coal actually doubled. This is very different from a simple one to one relation of data expanding to fill whatever supply becomes available. Rather, it's more like expanding supplies (at constant prices, hence decreasing price per kilobyte) actually forces the creation of new supply. Finally, another massive oversimplification that Parkinson's law casually dismisses is the vastly different usage and ownership patterns depending on price. As pointed out in SocialImplicationsOfTechnology?, when the price of a technology drops below a certain threshold where it is considered cheap, then you get a completely different pattern of usage and ownership. Instead of the technology being centralized and controlled by elites for their particular purposes (e.g., charging 12$ an hour to play an online text game as some companies did in the early days) then you get highly decentralized usage done for the benefit of the masses, as in PeerToPeer. Some problems are inherently slow. Consider an exponential problem O(2^n). If you double the speed of computation, you only get a solution for n+1 instead of n (within a fixed time; e.g. 15 hours). Assuming that your simulation allows n to grow as time permits (e.g. if n is number of simulated time increments), it seems quite plausible that 15 hours 15 years ago would get you essentially the same results (a few extra cycles, but not many) as 15 hours would get you today, even if computers are thousands of times faster. What isn't going to happen is a vast expansion of storage capacity into the 1000 terabyte range. The economics for it are quite clear; there is no pent up consumer demand for this. But there will be when that is the minimum drive space required to install Windows. Given the history, that's likely only 4 or 5 versions away. That's only 10 times the total information content of the US Library of Congress - and will someday soon be about the same amount of space needed to install a word processor not much different than the one you ran from a floppy disk 20 years ago. It was first articulated by C. Northcote Parkinson in the book Parkinson's Law: The Pursuit of Progress, (London, John Murray, 1958) based on extensive experience in the British Civil Service. The scientific observations which contributed to the law's development included noting that as Britain's overseas empire declined in importance, the number of employees at the Colonial Office increased. According to Parkinson, this is motivated by two forces: (1) "An official wants to multiply subordinates, not rivals" and (2) "Officials make work for each other." He also noted that the total of those employed inside a bureaucracy rose by 5-7% per year "irrespective of any variation in the amount of work (if any) to be done". Parkinson's law" is also used to refer to a derivative of the original relating to computers: "Data expands to fill the space available for storage"; buying more memory encourages the use of more memory-intensive techniques. It has been observed over the last 10 years that the memory usage of evolving systems tends to double roughly once every 18 months. Fortunately, memory density available for constant dollars also tends to double about once every 12 months (see Moore's Law); unfortunately, the laws of physics guarantee that the latter cannot continue indefinitely. Entrepreneur Tim Ferriss' new book, The 4 Hour Workweek, offers some extreme methods for doing more in less time. While some of his strategies are more applicable than others, one of my favorite points of the book was applying Parkinson's Law to your work life. Parkinson's Law dictates that a task will swell in (perceived) importance and complexity in relation to the time allotted for its completion. It is the magic of the imminent deadline. If I give you 24 hours to complete a project, the time pressure forces you to focus on execution, and you have no choice but to do only the bare essentials. If I give you a week to complete the same task, it's six days of making a mountain out of a molehill. If I give you two months, God forbid, it becomes a mental monster. The end product of the shorter deadline is almost inevitably of equal or higher quality due to greater focus. 1.) Limit tasks to the important to shorten work time. (80/20) 2.) Shorten work time to limit tasks to the important. (Parkinson's Law). Yesterday I found a copy of Parkinson's Law for $1 at a library book sale. This book is best known for it's opening line: Work expands so as to fill the time available for its completion. The principle in the opening line as understood today. I'd heard of the general principle of Parkinson's law a few years ago. I only found out about the book more recently. I didn't know until last night that Parkinson intended his principle to be applied more narrowly than it is applied now. Nowadays Parkinson's law is usually condensed to saying work expands to the time allowed. It is applied to individuals as well as a burgeoning bureaucracies. Parkinson discusses this interpretation in his opening paragraph but then limits his attention to organizations. The total effort that would occupy a busy man for three minutes all told may in this fashion leave another person prostrate after a day of doubt, anxiety, and toil. … the time spent on any item of the agenda will be in inverse proportion to the sum involved. The idea is that people are more likely to contribute to the discussion of things they understand. A nuclear reactor will sail through the finance committee, but a bicycle shed will cause endless debate because everyone can understand it and everyone has an opinion. I picked up a copy of Mrs. Parkinson's Law at the same book sale, also for $1. I'd never heard of it before, but I imagine it will be entertaining. General recognition recognition of this fact is shown in the proverbial phrase 'It is the busiest man who has time to spare.' Thus, an elderly lady of leisure can spend the entire day in writing and dispatching a postcard to her niece at Bognor Regis. An hour will be spent finding the postcard, another in hunting for spectacles, half an hour in a search for the address, an hour and a quarter in composition, and twenty minutes in deciding whether or not to take an umbrella when going to the pillar box in the next street. The total effort that would occupy a busy man for three minutes all told may in this fashion leave another person prostrate after a day of doubt, anxiety, and toil. Granted that work (and especially paperwork) is thus elastic in its demands on time, it is manifest that there need be little or no relationship between the work to be done and the size of the staff to which it may be assigned. A lack of real activity does not, of necessity, result in leisure. A lack of occupation is not necessarily revealed by a manifest idleness. The thing to be done swells in importance and complexity in a direct ratio with the time to be spent. This fact is widely recognized, but less attention has been paid to its wider implications, more especially in the field of public administration. Politicians and taxpayers have assumed (with occasional phases of doubt) that a rising total in the number of civil servants must reflect a growing volume of work to be done. Cynics, in questioning this belief, have imagined that the multiplication of officials must have left some of them idle or all of them able to work for shorter hours. But this is a matter in which faith and doubt seem equally misplaced. The fact is that the number of the officials and the quantity of the work are not related to each other at all. The rise in the total of those employed is governed by Parkinson's Law and would be much the same whether the volume of the work were to increase, diminish, or even disappear. The importance of Parkinson's Law lies in the fact that it is a law of growth based upon an analysis of the factors by which that growth is controlled. To comprehend Factor One, we must picture a civil servant, called A, who finds himself overworked. Whether this overwork is real or imaginary is immaterial, but we should observe, in passing, that A's sensation (or illusion) might easily result from his own decreasing energy: a normal symptom of middle age. For this real or imagined overwork there are, broadly speaking, three possible remedies. He may resign; he may ask to halve the work with a colleague called B; he may demand the assistance of two subordinates, to be called C and D. There is probably no instance, however, in history of A choosing any but the third alternative. By resignation he would lose his pension rights. By having B appointed, on his own level in the hierarchy, he would merely bring in a rival for promotion to W's vacancy when W (at long last) retires. So A would rather have C and D, junior men, below him. They will add to his consequence and, by dividing the work into two categories, as between C and D, he will have the merit of being the only man who comprehends them both. It is essential to realize at this point that C and D are, as it were, inseparable. To appoint C alone would have been impossible. Why? Because C, if by himself, would divide the work with A and so assume almost the equal status that has been refused in the first instance to B; a status the more emphasized if C is A's only possible successor. Subordinates must thus number two or more, each being thus kept in order by fear of the other's promotion. When C complains in turn of being overworked (as he certainly will) A will, with the concurrence of C, advise the appointment of two assistants to help C. But he can then avert internal friction only by advising the appointment of two more assistants to help D, whose position is much the same. With this recruitment of E, F, G and H the promotion of A is now practically certain. Seven officials are now doing what one did before. This is where Factor Two comes into operation. For these seven make so much work for each other that all are fully occupied and A is actually working harder than ever. An incoming document may well come before each of them in turn. Official E decides that it falls within the province of F, who places a draft reply before C, who amends it drastically before consulting D, who asks G to deal with it. But G goes on leave at this point, handing the file over to H, who drafts a minute that is signed by D and returned to C, who revises his draft accordingly and lays the new version before A. What does A do? He would have every excuse for signing the thing unread, for he has many other matters on his mind. Knowing now that he is to succeed W next year, he has to decide whether C or D should succeed to his own office. He had to agree to G's going on leave even if not yet strictly entitled to it. He is worried whether H should not have gone instead, for reasons of health. He has looked pale recently – partly but not solely because of his domestic troubles. Then there is the business of F's special increment of salary for the period of the conference and E's application for transfer to the Ministry of Pensions. A has heard that D is in love with a married typist and that G and F are no longer on speaking terms – no-one seems to know why. So A might be tempted to sign C's draft and have done with it. But A is a conscientious man. Beset as he is with problems created by his colleagues for themselves and for him – created by the mere fact of these officials' existence – he is not the man to shirk his duty. He reads through the draft with care, deletes the fussy paragraphs added by C and H, and restores the thing to the form preferred in the first instance by the able (if quarrelsome) F. He corrects the English – none of these young men can write grammatically – and finally produces the same reply he would have written if officials C to H had never been born. Far more people have taken far longer to produce the same result. No-one has been idle. All have done their best. And it is late in the evening before A finally quits his office and begins the return journey to Ealing. The last of the office lights are being turned off in the gathering dusk that marks the end of another day's administrative toil. Among the last to leave, A reflects with bowed shoulders and a wry smile that late hours, like grey hairs, are among the penalties of success. ...Most employees who defy the unwritten rule of "work harder, not smarter" know that, despite the greater return on investment for the company, it's not always appreciated. That's related to the idea that the longer something takes to complete, the better quality it must inherently be. Thankfully, the increasing trend of telecommuted employment is changing this for those lucky early adopters, but only because employers have no idea what you're doing with all that spare time! Let's look at a few ways you can apply Parkinson's Law to your life, get your to-do list checked off quicker and spend less of the work day filling in time just to look busy. This is relevant whether you work in an office or at home, since "work harder, not smarter" is a cultural idea that many individuals fall prey to even when nobody's supervising their work. Make a list of your tasks, and divide them up by the amount of time it takes to complete them. Then give yourself half that time to complete each task. You have to see making the time limit as crucial. Treat it like any other deadline. Part of reversing what we've been indoctrinated with (work harder, not smarter) is to see the deadlines you set for yourself as unbreakable – just like the deadlines your boss or clients set. Use that human, instinctual longing for competition that fuels such industries as sports and gaming to make this work for you. You have to win against the clock; strive to beat it as if it were your opponent, without taking shortcuts and producing low-quality output. This is particularly helpful if you're having trouble taking your own deadlines seriously. At first, this will be partially an exercise in determining how accurate your time projections for tasks are. Some may be spot on to begin with, and some may be inflated. Those that are spot on may be the ones that you are unable to beat the clock with when you halve the time allotment, so experiment with longer times. Don't jump straight back to the original time allotment because there may be an optimum period in between. If you work at a computer, a digital timer is going to be very useful when you start doing this. It'll also save you a bit of time, because a timer allows you to see at a glance how much longer you have. Using your clock involves some addition and subtraction! There are free utilities available for OS X, Linux, and Windows. Look for those little time-fillers, like email and feed reading, that you might usually think take ten or twenty (or even, god forbid, thirty!) minutes. These are the "cockroaches" of the productivity world – little pests that do nothing but make your life a pain in the backside, pains that you can't seem to get rid no matter how much you run around the house with a shoe or bug spray. Instead of doing the leisurely 20-30 minute morning email check, give yourself five minutes. If you're up for a challenge, go one better and give yourself two minutes. Don't give these tasks any more attention until you've completed everything on your to-do list that day, at which point you can indulge in some email reading, social networking and feed reading to your heart's content. Not that I recommend you spend all your spare time that way! These are tasks where 10% of what you do is important and 90% is absolutely useless. This forces you to tend to the important tasks – feeds you need to read in order to improve in your work (for instance, if you're a web designer who needs to be read up on new practices), and emails that are actually high-priority. Experiment with how far you can take this. Make your criteria for what makes an email important, really strict and the penalties harsh! That means using the Delete button, by the way – I'm not advocating violence against your colleagues. You can experiment with Parkinson's Law and squashing your deadlines down to the bare minimum in many areas of your life. Just be conscious of the line between 'bare minimum' and 'not enough time' – what you're aiming for is a job well done in less time, not a disaster that's going to lose you employment or clients. My CPA sends a letter that basically says hey your stuff is due March 23rd. Problem-I am leaving for a short mini vacation with the family. A long overdue one. I don't really have a choice because even if we file an extension the books need updated and the docs organized so an attempt to estimate payments can be made. Bummer- I thought I could sign a form and procrastinate this mammoth project until I came home. In the past few months I had estimated that this project, which I'll explain below, would take two weeks solid. My wife never totally believed me and turns out she was both right and wrong. Now let me paint the picture. I started my business in the fall of 2007. I didn't have much in the way of banking statements or financials in 2007. It was mainly start-up stuff. In 2008, I had a credit card and a business checking account and all the transactions which go with them. I used Quickbooks but not properly. I knew I was balanced through my online banking and register, but I failed to enter all credit card receipts and reconcile them. The same went for bank statements. My CPA told me that it had to be done. Wow-18 months of credit card receipts and bank transactions to reconcile! Then gathering personal tax records (that part was easier as we have a system for organizing them throughout the year), and putting it all together for delivery. I started at 7PM while watching my favorite basketball team lose in the NIT. Not exactly motivating stuff. I knew that at 9AM we were leaving for Gatlinburg, TN. I had others thing to do as well like packing. This was much easier because we live a simple and organized life, but still it amazed me that it was possible. I starting sorting all the receipts based on credit card or business checking account. I then clipped them together based on the month. All 18 of them. I went back and entered any missing transactions from bank statements, alternating the credit card statements as well. I did this all night and into the morning. I reconciled each statement as I went. I kept 2007 separate from 2008 and from 2009 for filing and tax purposes. To my amazement everything balanced. I backed everything up to a flash drive and looked at the clock-6AM. I spent the next two hours organizing personal schedule C, D and normal deductions like charitable, medical, etc. I packed and attended to other tasks. I pulled all this together in a package and we delivered it to the CPA firm on the way. A sorry goes out to my in-laws as we did add about an hour to the commute. So does Parkinson's Law work? Remember when I said my wife was both right and wrong, well she was. If I had tackled this over a few weeks it would have taken a few weeks or longer. Giving myself no other options but to finish it between 7PM and 9AM, I finished it and I feel like it was a better output as well. No, I did not drive on the trip and got some good sleep the next few nights. I'll take that trade-off. No I'm not recommending you batch your accounting annually either- maybe monthly. The report of the Royal Commission on the Civil Service was published on Thursday afternoon. Time has not permitted any comment in this week's issue of The Economist on the contents of the Report. But the startling discovery enunciated by a correspondent in the following article is certainly relevant to what should have been in it. IT is a commonplace observation that work expands so as to fill the time available for its completion. Thus, an elderly lady of leisure can spend the entire day in writing and despatching a postcard to her niece at Bognor Regis. An hour will be spent in finding the postcard, another in hunting for spectacles, half-an-hour in a search for the address, an hour and a quarter in composition, and twenty minutes in deciding whether or not to take an umbrella when going to the pillar-box in the next street. The total effort which would occupy a busy man for three minutes all told may in this fashion leave another person prostrate after a day of doubt, anxiety and toil. Granted that work (and especially paper work) is thus elastic in its demands on time, it is manifest that there need be little or no relationship between the work to be done and the size of the staff to which it may be assigned. Before the discovery of a new scientific law-herewith presented to the public for the first time, and to be called Parkinson's Law*-there has, however, been insufficient recognition of the implications of this fact in the field of public administration. Politicians and taxpayers have assumed (with occasional phases of doubt) that a rising total in the number of civil servants must reflect a growing volume of work to be done. Cynics, in questioning this belief, have imagined that the multiplication of officials must have left some of them idle or all of them able to work for shorter hours. But this is a matter in which faith and doubt seem equally misplaced. The fact is that the number of the officials and the quantity of the work to be done are not related to each other at all. The rise in the total of those employed is governed by Parkinson's Law, and would be much the same whether the volume of the work were to increase, diminish or even disappear. The importance of Parkinson's Law lies in the fact that it is a law of growth based upon an analysis of the factors by which that growth is controlled. Factor II.-Officials make work for each other. We must now examine these motive forces in turn. (2) He may ask to halve the work with a colleague called B. (3) He may demand the assistance of two subordinates, to be called C and D.
There is probably no instance in civil service history of A choosing any but the third alternative. By resignation he would lose his pension rights. By having B appointed, on his own level in the hierarchy, he would merely bring in a rival for promotion to W's vacancy when W (at long last) retires. So A would rather have C and D, junior men, below him. They will add to his consequence; and, by dividing the work into two categories, as between C and D, he will have the merit of being the only man who comprehends them both. It is essential to realise, at this point, that C and D are, as it were, inseparable. To appoint C alone would have been impossible. Why? Because C, if by himself, would divide the work with A and so assume almost the equal status which has been refused in the first instance to B; a status the more emphasised if C is A's only possible successor. Subordinates must thus number two or more, each being kept in order by fear of the other's promotion. When C complains in turn of being overworked (as he certainly will) A will, with the concurrence of C, advise the appointment of two assistants to help C. But he can then avert internal friction only by advising the appointment of two more assistants to help D, whose position is much the same. With this recruitment of E, F, G and H, the promotion of A is now practically certain. Seven officials are now doing what one did before. This is where Factor II comes into operation. For these seven make so much work for each other that all are fully occupied and A is actually working harder than ever. An incoming document may well come before each of them in turn. Official E decides that it falls within the province of F, who places a draft reply before C, who amends it drastically before consulting D, who asks G to deal with it. But G goes on leave at this point, handing the file over to H, who drafts a minute, which is signed by D and returned to C, who revises his draft accordingly and lays the new version before A. What does A do? He would have every excuse for signing the thing unread, for he has many other matters on his mind. Knowing now that he is to succeed W next year, he has to decide whether C or D should succeed to his own office. He had to agree to G going on leave, although not yet strictly entitled to it. He is worried whether H should not have gone instead, for reasons of health. He has looked pale recently-partly but not solely because of his domestic troubles. Then there is the business of F's special increment of salary for the period of the conference, and E's application for transfer to the Ministry of Pensions. A has heard that D is in love with a married typist and that G and F are no longer on speaking terms-no one seems to know why. So A might be tempted to sign C's draft and have done with it. But A is a conscientious man. Beset as he is with problems created by his colleagues for themselves and for him-created by the mere fact of these officials' existence-he is not the man to shirk his duty. He reads through the draft with care, deletes the fussy paragraphs added by C and H and restores the thing back to the form preferred in the first instance by the able (if quarrelsome) F. He corrects the English-none of these young men can write grammatically-and finally produces the same reply he would have written if officials C to H had never been born. Far more people have taken far longer to produce the same result. No one has been idle. All have done their best. And it is late in the evening before A finally quits his office and begins the return journey to Ealing. The last of the office lights are being turned off in the gathering dusk which marks the end of another day's administrative toil. Among the last to leave, A reflects, with bowed shoulders and a wry smile, that late hours, like grey hairs, are among the penalties of success. From this description of the factors at work the student of political science will recognise that administrators are more or less bound to multiply. Nothing has yet been said, however, about the period of time likely to elapse between the date of A's appointment and the date from which we can calculate the pensionable service of H. Vast masses of statistical evidence have been collected and it is from a study of this data that Parkinson's Law has been deduced. Space will not allow of detailed analysis, but research began in the British Navy Estimates. These were chosen because the Admiralty's responsibilities are more easily measurable than those of (say) the Board of Trade. 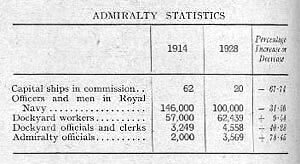 The accompanying table is derived from Admiralty statistics for 1914 and 1928. The criticism voiced at the time centred on the comparison between the sharp fall in numbers of those available for fighting and the sharp rise in those available only for administration, the creation, it was said, of "a magnificent Navy on land." But that comparison is not to the present purpose. What we have to note is that the 2,000 Admiralty officials of 1914 had become the 3,569 of 1928; and that this growth was unrelated to any possible increase in their work. The Navy during that period had diminished, in point of fact, by a third in men and two-thirds in ships. Nor, from 1922 onwards, was its strength even expected to increase, for its total of ships (unlike its total of officials) was limited by the Washington Naval Agreement of that year. Yet in these circumstances we had a 78.45 per cent increase in Admiralty officials over a period of fourteen years; an average increase of 5.6 per cent a year on the earlier total. In fact, as we shall see, the rate of increase was not as regular as that. All we have to consider, at this stage, is the percentage rise over a given period. Can this rise in the total number of civil servants be accounted for except on the assumption that such a total must always rise by a law governing its growth? It might be urged, at this point, that the period under discussion was one of rapid development in naval technique. The use of the flying machine was no longer confined to the eccentric. Submarines were tolerated if not approved. Engineer officers were beginning to be regarded as almost human. In so revolutionary an age we might expect that storekeepers would have more elaborate inventories to compile. We might not wonder to see more draughtsmen on the pay-roll, more designers, more technicians and scientists. But these, the dockyard officials, increased only by 40 per cent in number, while the men of Whitehall increased by nearly 80 per cent. For every new foreman or electrical engineer at Portsmouth there had to be two more clerks at Charing Cross. From this we might be tempted to conclude, provisionally, that the rate of increase in administrative staff is likely to be double that of the technical staff at a time when the actually useful strength (in this case, of seamen) is being reduced by 31.5 per cent. It has been proved, however, statistically, that this last percentage is irrelevant. The officials would have multiplied at the same rate had there been no actual seamen at all. It would be interesting to follow the further progress by which the 8,118 Admiralty staff of 1935 came to number 33,788 by 1954. But the staff of the Colonial Office affords a better field of study during a period of Imperial decline. The relevant statistics are set down below. Before showing what the rate of increase is, we must observe that the extent of this department's responsibilities was far from constant during these twenty years. The colonial territories were not much altered in area or population between 1935 and 1939. They were considerably diminished by 1943, certain areas being in enemy hands. They were increased again in 1947, but have since then shrunk steadily from year to year as successive colonies achieve self-government. It would be rational, prior to the discovery of Parkinson's Law, to suppose that these changes in the scope of Empire would be reflected in the size of its central administration. But a glance at the figures shows that the staff totals represent automatic stages in an inevitable increase. And this increase, while related to that observed in other departments, has nothing to do with the size-or even the existence-of the Empire. What are the percentages of increase? We must ignore, for this purpose, the rapid increase in staff which accompanied the diminution of responsibility during World War II. We should note rather the peacetime rates of increase; over 5.24 per cent between 1935 and 1939, and 6.55 per cent between 1947 and 1954. This gives an average increase of 5.89 per cent each year, a percentage markedly similar to that already found in the Admiralty staff increase between 1914 and 1928. Where k is the number of staff seeking promotion through the appointment of subordinates; p represents the difference between the ages of appointment and retirement; m is the number of man-hours devoted to answering minutes within the department; and n is the number of effective units being administered. Then x will be the number of new staff required each year. where y represents the total original staff. And this figure will invariably prove to be between 5.17 per cent and 6.56 per cent, irrespective of any variation in the amount of work (if any) to be done. The discovery of this formula and of the general principles upon which it is based has, of course, no emotive value. No attempt has been made to inquire whether departments ought to grow in size. Those who hold that this growth is essential to gain full employment are fully entitled to their opinion. Those who doubt the stability of an economy based upon reading each other's minutes are equally entitled to theirs. Parkinson's Law is a purely scientific discovery, inapplicable except in theory to the politics of the day. It is not the business of the botanist to eradicate the weeds. Enough for him if he can tell us just how fast they grow. I've always considered Parkinson's Law to be the chief weapon of inept managers who "schedule aggressively" in an attempt to squeeze blood from stones, and thus compromise their project's effeciency, morale, and the like. After reading this book I've discovered that Parkinson's Law is *not* the often misquoted "Work expands so as to fill the time available for its completion" but (paraphrasing:) "the number of administrators in an organization will grow at a steady rate irrespective of the amount of work that organization needs to do." Not only does Parkinson never suggest that we should "schedule aggressively" (he never suggests that work can contract indefinitely no matter how little time is made available), he ridiculues nice offices, large meetings, top-heavy management, insecure leadership, penny-wiseness and pound-foolishness, typical hiring practices, and more. While reading most of this book I had a wry grin on my face, and I laughed loud belly laughs at a couple of points. My only complaints stem from the last two chapters, which indulged in both racism and ageism, respectively. I only skimmed those. Still, an enjoyable and motivational read, and useful knowledge when confronted by a manager who thinks of themself as Parkinsonian but hasn't actually read (or understood) Parkinson. Parkinson's Law gives, in synopsis form, an extremely practical guide to the rationales, realtime actions and quirks of human behavior that all too often manifest themselves only among the inhabitants of the business world. Parkinson's examples of boardroom behavior and decision making, or lack thereof, are extraordinarily and frighteningly accurate. I found it amazingly funny, easy to read and retain, though a bit dated given the time which has elapsed since it was originally published. On a personal note, this was one of the first books that my father gave me to read in preparation for life. Also included in my father's reading list for life were The Peter Principle, Yes, Minister, and Aristotelian Ethics. I would recommend this book, despite the time that has passed since it was originally published, to those who wish a quick primer as to what awaits them as they climb the business ladder and a few hints on how not to miss a rung. I first received a copy of "Parkinson's Law" from a retired three-star general. Since that time, I've seen copies on the shelves of almost every powerful person I know, from professors and deans to lawyers and businesspeople. Based on this wide-spread popularity, I can safely conclude that C. Northcote Parkinson has written something that transcends his time and profession to become a true classic. He has written, in short, the definitive work on bureaucracy. Chapter one contains the titular law, which is frequently misquoted. The actual law gives a mathematical formula for how fast an office will grow, simply by observing that every bureaucrat will demand two subordinates at certain times. Parkinson backs this up with analysis of various British government bodies. The Colonial Office, for instance, more than doubled in size even as the number of colonies was shrinking. This is a rock-solid rule, as far as I can tell, and particularly relevant to an America where we somehow spend $728 billion despite having fewer actual soldiers than at any time in the past sixty years. Chapter three famously looks at budget meetings. The conclusion is that up to a certain point, committees will spend more time on items that cost less. Some trivially small item, such as coffee, is easily understood, so every committee member has an opinion about it. On the other hand, nobody really understands expensive items such as reactors, so nobody has much to say about them. This is a phenomenon which I've seen arising in real life time and time again. Chapter four is perhaps the most fascinating and devastatingly accurate one in the book. The hypothesis is that whenever an organization builds a fancy new headquarters, its time is up. Parkinson offers mainly British examples, but we can see the truth of this in America. The Sears Tower went up at precisely the moment when the Sears Corporation went down. When construction began on the AOL Time Warner Center in 2000, that should have been our indication that the dot-com boom was on its last legs. There are ten chapters in all, but I'll let you discover the delights of the later ones on your own. For sure, some chapters aren't quite so hard-hitting. Chapter two on the French Parliament may strike some as no longer relevant, while chapter nine on crime and economics in China contains some cringe-inducing racism. But on the whole, "Parkinson's Law" is a delightful little book (150 pages) that will explain while it amuses you. "The Seven Habits of Highly Effective People" and "Who Moved My Cheese" may rule the bestseller lists, but C. Northcote Parkinson has the real answers for the business world. Parkinson's Law, written by C. Northcote Parkinson, is a wonderful book which explores the realities of human behavior within a bureaucracy. The author doesn't pay attention to theories or the idealized world, but instead writes about how people really function in organizations. The title of the book is from Parkinson's statement that "Work expands so as to fill the time available for its completion." He explains that "an elderly lady of leisure can spend the entire day in writing and dispatching a postcard to her niece at Bognor Regis." In contrast if all you have is five minutes to write a postcard, it takes just five minutes to write the postcard. Parkinson writes that it takes great discipline to fight the tendency to use up all the time available to do some job. And likewise it takes great discipline to save some of your income, or to avoid buying stuff just because you have room for it. Parkinson has a number of other interesting observations. For example in his Law of Triviality he explains how a group of managers might spend hours on selecting a coffeepot and minutes on deciding matters of much greater importance. I also appreciated his explanation on the effective size of a governing group. He says that the right number of people to lead an organization, like a business or a country, is about five. As the group gets larger, it takes longer and longer to get together and to agree on matters. There are many other insightful comments on a variety of topics related to organizations. This is a great book to have teenagers read, and then to be reread every couple years. Just over a hundred pages it is a quick read, as well as being enjoyable. If you haven't read Parkinson's Law before, I encourage you to read it this week. "Heaven forbid that students should cease to read books on the science of public or business administration -- provided only that these works are classified as fiction...intermingled with volumes about ape men and space ships, these textbooks could harm no one"
This quote, from the preface, sets the tone for the rest of the book. We've all seen just how efficient government and corporate bureaucracy is, but Parkinson shows us that we still give them too much credit. This devastating and witty satire goes after every aspect of administration and really makes one wonder how anything ever gets done at all. And it was written in the 50s. Given the expansion of government and the rise of multinational corporate conglomerates since then, this book is as relevant now as when it was written. Pick it up and find out just how deep the rabbit hole of incompetence goes. 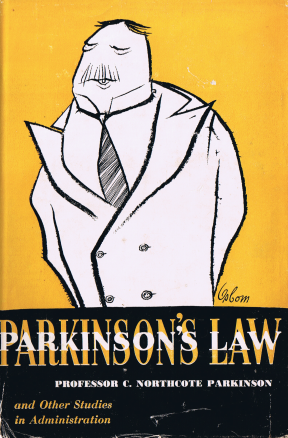 Parkinson begins, appropriately enough, by describing Parkinson's Law: "Work expands so as to fill the time available for its completion." Thus, a retired old lady can spend hours writing and mailing a postcard, while a busy man will get it done in a few minutes. Closely related is the steady expansion of bureaucracies: every bureaucrat wants assistants both to increase his importance and lighten his workload, but it turns out that managing these assistants (who will eventually want assistants of their own) takes up any time he might have saved, and before long there are five people doing a job that one man was perfectly capable of doing himself. Bureaucrats create work for each other. To illustrate this point, Parkinson points out how the staff at the Colonial Office swelled while the Empire was losing its overseas colonies and how the Royal Navy hired more clerks and officials at a time when most of the capital ships were decommissioned and the number of seamen fell by 30%. That's all in the first chapter. Later, Parkinson shows how budget committees spend their time. Nobody on those committees knows much about nuclear reactors, so there's not much to discuss about a $10 million proposal for a new reactor; it's approved within minutes. However, most of the committee knows about bicycle sheds, so they can have a lively debate on how to cut costs on a proposed bicycle shed for employees--and everyone knows about coffee, so naturally they'll have the longest, best-informed debate on the subject of whether to get a new coffee machine. Penny wise, pound foolish. Later chapters detail the inverse ratio between the size of a cabinet and its effectiveness as well as why the best indicator of an organization's decline is the construction of a new headquarters, among other morsels of wisdom. Some of the content might be a bit dated (and one chapter is arguably racist), but the rest of the book more than compensates. I highly recommend it.